Arizona Roof Rescue » Blog » Do I Need to Replace My Roof? There are many expenses in our lives that we may not be prepared to think about because of their long-term effects. You may be prepared to dole out money to repair your car, or replace your broken phone, but roofing is another story. Most roofing should last from ten to twenty-five years, so it’s quite easy to forget about if you have not had constant problems with your roofing in the past. Good roofing should easily be forgotten about, so when your roof needs replacing, it can sometimes come as a bit of a shock to you. But it’s better to know when to replace your roof than to wait for it to cave in on you during the next rain storm. One sign that is a clear warning to you to replace your roof is curled up shingles. When the shingles curl up, this allows rain and other weathering to leak into your attic and damage your home. The shingles get weaker over time, and the wind soon loosens the shingle and makes it curl, revealing the bare roof beneath. This is a great indication of when you should replace your roof. Another great way to know when to replace your roof is the missing granules in your shingles. As mentioned before, shingles get weaker over time and the granules can loosen and fall into your gutters and on the ground below. Another way of telling if the granules have worn off is the visible dark spots in the shingles. Though, these may be harder to detect without a proper inspection of your house by a trained professional. A sure fire way to know when to replace your roof is the presences of loose or missing shingles. These are extraordinarily easy to spot. Gaps in your roof can be seen from further away and the loose ones will be easily identifiable by a trained professional. This is why you must consult an expert. Taking one step on a loose shingle could mean the difference between you staying on the roof and you falling to the earth below. Cracked shingles can also be good indicators of a roof that needs replacing. These can cause common roof leaks and damage the interior of your house with the smallest amount of rain. It’s best to at least replace these shingles when this starts happening, if not the entire roof. Though they are not as damaging in appearance, cracked shingles are frequently the cause of most roof leakage. And if your roof was not properly installed, nail pops can be quite devastating to it. Nail pops are improperly driven nails that dent the shingles, or damage them in any ways. This causes the nail to pop out and lift the shingle, allowing for wind, water, and other elements to reach the surface of your roof and ultimately cause more damage to the interior of your house. Poorly installed roofing is a major cause of nail pos. One huge indicator that you may need to replace your roof and requires little inspection is dark spots in your ceiling. This means that rain has gotten through the barrier your shingles create and have invaded your attic to damage the sheetrock and insulation that further guards you from the elements. This means that the ceiling as well as the insulation must be repaired, along with the added expense of your roof. Black or green streaks may also mean that your roof needs replacing. This means that algae has begun to grow across your shingles and it can look quite awful from the street. Though this may not require an immediate replacing, continuous use of harsh chemicals as well as pressure washing can considerably shorten the life of your shingles. Finally, knowing just how old your roof is can be a great indicator of whether or not your roof needs replacing now or in the immediate future. Most shingles and roofing are guaranteed to last anywhere from ten to twenty-five years. But harsh weather conditions in your area could change this considerably. Knowing how old your roofing is could help you make your decision. Here in Phoenix Arizona, monsoon season is just about the only weather we get, so your roofing could last for the standard twenty years. 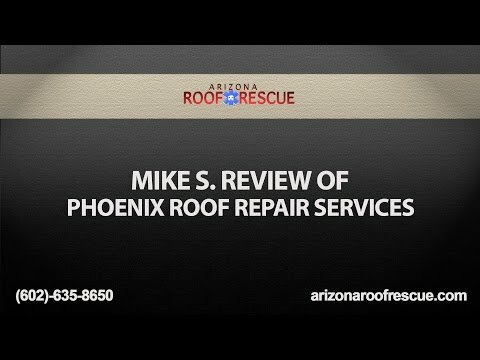 If you have realized that your roof needs to be replaced, come to Arizona Roof Rescue in Phoenix. We specialize in all areas of roofing, including roof repair, roof replacement, structural damage to your roof, and much more services in Phoenix. We can give you a free estimate of just how much replacing your roof will cost, and you can trust that we will get the job done in a timely, professional manner that will keep your roof in tip-top shape for years to come. So for all of your roofing needs, contact Arizona Roof Rescue for more information, at (602)-242-2706. Home » Blog » Do I Need to Replace My Roof?